It’s Shakespeare at Joss Whedon’s house. That’s a big deal for a lot of fans of Whedon, Shakespeare, or both. Me, I’m in the second category. I’ve liked some of Whedon’s projects (The Avengers, Dr. Horrible’s Sing-a-Long Blog), but despite my best efforts was never able to become a fan of perhaps his most famous work, Buffy the Vampire Slayer. I know, I know. 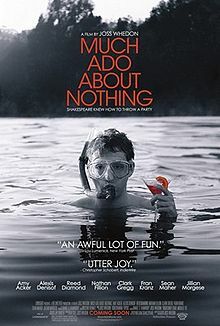 Maybe I have to turn in my “geek card” right now, but still, I have a lot of respect for Whedon and I absolutely love Shakespeare, so I was very curious to see this adaptation of Much Ado About Nothing. It’s a collaboration of one of the most prominent creative artists of today and one of the most celebrated writers of all time, and that’s exciting no matter what. I just hoped that the movie would live up to my very lofty expectations, and for the most part, it did. Much Ado is one of Shakepeare’s most popular comedies, famously filmed before (excellently) by Kenneth Branagh in 1994. The approach here, though, is different—updating the story to the present day and setting it in and around the grounds of one elegantly appointed house as opposed to the Italian villa of the play and previous film. The story of soldiers Don Pedro (Reed Diamond), Benedick (Alexis Denisof), Claudio (Fran Kranz ) and company has been styled with more of a celebrity flair, with paparazzi and news cameras recording the arrival of the “soldiers” from an undefined “war” that is presented as some kind of big business deal instead of actual combat. The “warriors” arrive from “battle” to relax and mingle at Don Pedro’s tony mansion and there the action ensues in the forms of assorted romances, battles of wits, extravagant dinner parties and attempted revenge. Beatrice (Amy Acker) and Benedick verbally spar and Claudio woos Hero (Jillian Morgese), while Don Pedro’s vengeful brother Don John (Sean Maher) plots to get even with his brother any way possible, and police constable Dogberry (Nathan Fillion) and his crew of officers try in a hilariously bumbling fashion to maintain order. It’s a story full of comedy, genuine sentiment, romance, sexual tension, and simmering anger, all presented ideally in the modern setting by a strong cast containing many Whedon “regulars” who have been in several of his productions before, and it’s an excellent troupe. Amy Acker and Alexis Denisof work together exceptionally well as Beatrice and Benedick. Acker brings all the depth to the role of Beatrice that is needed, bringing out the character’s pain and sadness as well as her sharp wit, and Denisof makes a suitably preening Benedick. Their scenes together crackle with energy, and their animosity and eventual romance are both eminently believable. Reed Diamond is a stable presence as Don Pedro, and Kranz has all the earnestness mingled with self-doubt necessary to be an ideal Claudio. His scenes with Morgese as Hero are alternately touching, infuriating, heartbreaking and ultimately heartwarming. Maher is a truly menacing Don John, and the added dynamic in this film of casting his crony Conrade as a woman (Riki Lindhome) adds a unique twist. Fillion, in the clownish role of Dogberry, was also ideally cast, bringing both charm and ridiculousness to the role in equal measure. Overall, it was an extremely strong ensemble that brought out all the comedy and drama of the material with a sense of style and bravado that was matched perfectly by the filming. This film was made on a reportedly very low budget, but doesn’t look it. It was also filmed on location almost entirely at Whedon’s actual house, so in the hands of a lesser director this movie could easily end up looking like an elaborate real estate ad, and even though it doesn’t go that far, the house–along with its elaborate grounds–really is one of the major “stars” of this film. The black-and-white filming showcases the setting ideally, bringing out the details in every scene and adding a stylized air to the proceedings. The audience is left to imagine the colors of the furniture, the greenery in the garden, the food in the kitchen, and for this reason these items are made to appear all the more colorful in the imagining. The excellent filming and sophisticated soundtrack sets an upcsale, classy atmosphere for these proceedings, helping in bringing Shakespeare’s text into the modern day and allowing the audience to approach the material in a fresh light. There are so many great elements to this film, and the overall air is one of sophistication, intelligence and real wit. It’s a Shakespeare adaptation for the 21st Century that manages to be both timeless and current at the same time. It reaffirms my love of Shakespeare and makes me want to check out more of Whedon’s work. It’s a winning collaboration that I think will stand up even better on repeated viewings. It looks like Joss Whedon not only invited Shakespeare to his house, but he lets his audience join in for the party, and the experience is more than worthwhile.